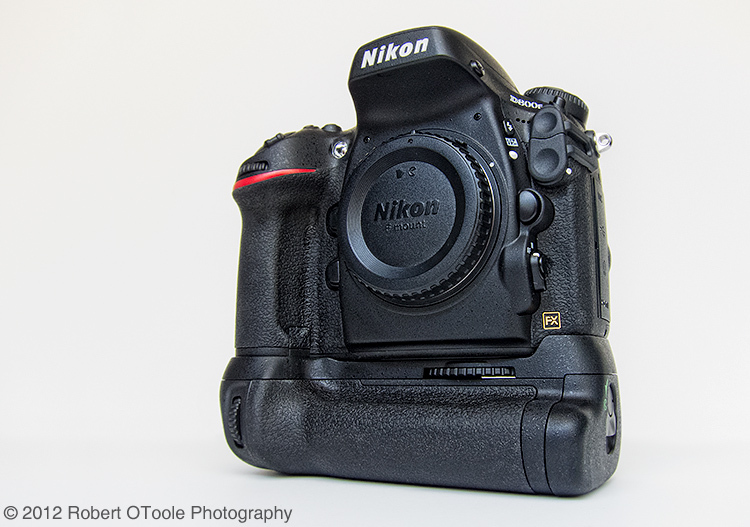 Nikon D800E with MB-D12 battery grip. As far as I am concerned the MB-D12 is a must have accessory with the higher frame rate and ability to use multiple power sources but it will cost you. The D800 EN-EL15 battery will only allow 4 fps in FX mode and 5 fps in DX mode with or without the MB-D12 battery grip. With the MB-D12 installed the D800 will shoot at 6 fps in DX mode (4 fps maximum in FX) with AA size batteries or the optional EN-EL18 battery + BL-5 battery chamber cover. To enable DX mode automatically just mount a DX lens or to enable DX mode manually when using an FX or full frame lens go to Menu > Shooting Menu > Image Area > Choose image area > DX. This grip adds a vertical shutter release and front / rear command dials. Another important advantage for me is that the MB-D12 allows the use the D4's EN-EL18 battery with the BL-5 battery chamber cover. 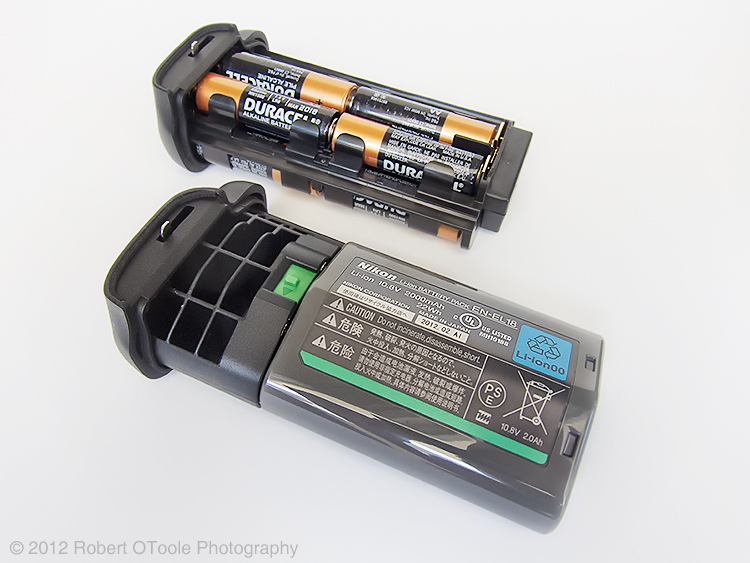 I prefer EN-EL18 + BL-5 combination in place of the MS-D12 AA Battery Holder for a weight savings and almost twice the capacity of AA size batteries. Since I also shoot with a D4 using the EN-EL18 + BL-5 combination allows me to travel with a single Nikon battery charger. Nikon EN-EL18 battery + BL-5 chamber cover and MS-D12 AA Battery Holder at the top . You can see why you cant just pull and use the Nikon EN-EL18 battery without the BL-5. Note now much shorter the EN-EL18 is at the top compared to the EN-EL18 + BL-5 combo at the bottom. Why doesnt the D800 achieve 6 fps with the EN-EL15 camera battery? The EN-EL15 output is only 7 volts, while the EN-EL18 battery puts out 10.8 volts, and the standard alkaline or lithium AA battery is rated at 1.5 volts, or 12 volts for a set of 8. What are the different battery capacities? The number of shots that can be taken with fully-charged batteries varies with the condition of the battery, temperature, and how the camera is used. 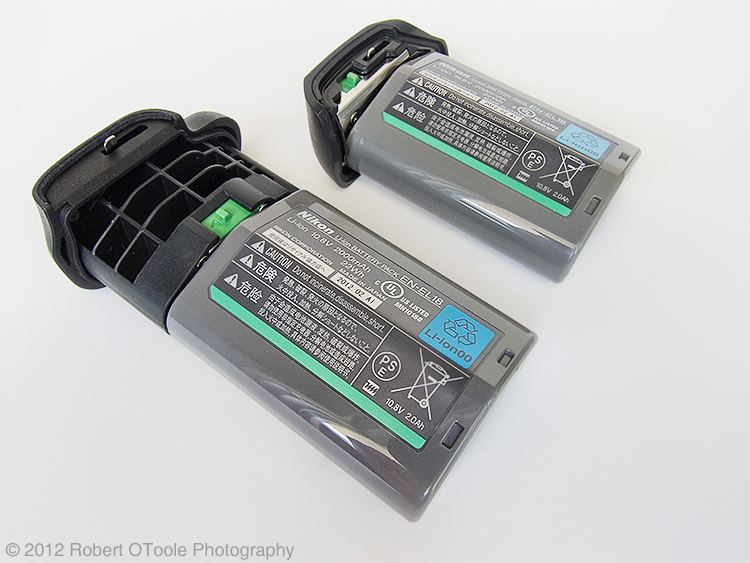 In the case of AA batteries, capacity also varies with make and storage conditions; some batteries can not be used. Sample figures for the camera and optional MB-D12 multi-power battery pack are given below. Note: according to Nikon you can reach 6 fps without the MB-D12 by using the EH05b AC adapter and EP-5B power connector.